Fishermen’s News Online Oct 10, 2018. Bristol Bay is home to the largest wild sockeye salmon run in the world, providing the fishing industry with billions in revenue. 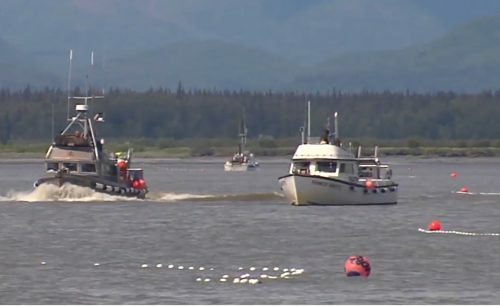 Commercial fishermen engaged in the Bristol Bay salmon fishery had a record year in 2018, and in more ways than one. State biologists say the 2018 run of Bristol Bay sockeye salmon was the largest on record, dating back to 1893, and 69 percent above the 36.9 million average run of the last 20 years. It was also the fourth consecutive year that inshore sockeye runs exceeded 50 million fish, and 21 percent above the preseason inshore forecast of 51.3 million fish. In fact, runs to all districts except Egegik exceeded the preseason forecast. The commercial harvest of 41.3 million reds was 10 percent above the 37.6 million preseason forecast and the second largest harvest on record. The fishery also met or exceeded all sockeye escapement goals, with a total bay-wide escapement of 21 million fish. Preliminary harvests for other Pacific salmon species in Bristol Bay calculated by ADF&G were 1.9 million chums, 218,998 humpies, 138,466 silvers and 41,696 Chinooks. Ex-vessel values also reached record levels. The preliminary ex-vessel value of all salmon species in the Bay was $281 million, 242 percent above the 20-year average of $116 million, and 39 percent higher than the $202 million ex-vessel value of the 1990 harvest. The 43.5 million harvest of all species was the second largest in the history of the Bay, surpassed only by the 45.4 million salmon of 1995. The 41.3 million sockeye harvest came second to the 1995 salmon harvest. Statewide as of Oct. 1 the wild salmon commercial harvest stood at 113,400,000 fish, including more than 50 million sockeyes, 40 million humpies, 20 million chum, 3.5 million coho and 240,000 kings. More than 75 million of those fish came from Alaska’s central region, 21 million from Southeast Alaska, 14.6 million from the westward region and 2.3 million from the Arctic-Yukon-Kuskokwim region.